Matou no Houkai (魔塔の崩壊, Matou no Houkai? lit. 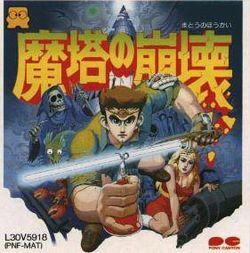 Collapse of the Demon Tower), subtitled "The Hero of Babel", is adventure game developed by Carry Lab for the Famicom Disk System, and published by Pony Canyon in 1988. It is Carry Lab's second and final game for the Famicom Disk System after the game that became Mystery Quest, and also the last game it ever developed. It closed its doors shortly afterwards. Matou no Houkai is a 2D side-scrolling platformer that is heavily influenced by Konami's Castlevania series, particularly the second game Simon's Quest. The protagonist must climb up and down a horizontally-looping tower, defeating enemies along the way. The game contains RPG elements too, such as gaining experience points to level up and grow stronger. Players can find extra treasures and power-ups hidden inside chests, including a set of sub-weapons that more or less mirror those found in Castlevania. The player moves at a relatively slow pace, and knowledge of Japanese is necessary to understand some of the requirements that you must meet to complete a level. The game was never released outside of Japan. During the height of Babylonian civilization, people built the Tower of Babel in an attempt to reach god. God sees this, and becomes angry with mankind's hubris. He rains thunder down upon the tower to drive people away. In order to keep people away from the tower, god fills it up with giant creatures and evil spirits. Several thousands of years later, the strongest devil Asmodeous gains control over all of the creatures and spirits that god placed in the tower. He attacks the neighboring towns, and steals all of their golden and silver treasures, as well as the most beautiful maiden in the land. Your mission of salvation is to rescue the maiden, and destroy the cursed tower in order to return peace to the world. This page was last edited on 10 June 2017, at 12:39.